In their years of service on British Railways the Peaks were well travelled, visiting all the regions on a regular basis - despite teething troubles in the 1960's they did the jobs they were built for, wherever it took them. They were handicapped however, by their weight and their four axle bogies - issues that would eventually be part of their demise. Their years in service, like most of BR's diesel fleet, found them involved in accidents which occasionally necessitated major repair work to be carried out. Notable examples of this include D94 at Stanton Gate in the early 1960's and 125 in its rear end collision at Bridgewater on October 23rd 1974. The 1968 National Traction Plan, a type of fix for the failings of the 1955 Modernisation Plan put forward a fleet rationalisation of locomotive types from twenty eight down to fifteen. This principally dealt a blow to the diesel hydraulics and the smaller, less successful classes, most of which would be phased out by 1972. This did not affect the future of the Peaks, however things were on the horizon that would! The completion of the West Coast main line electrification in 1975, the introduction of the HSTs, the decline in freight traffic and the steady conversion of passenger services equipped with air braked electrically heated stock suggested that the usefullness of the Peaks clearly now had limits. Two bright spot had been the equipping of all the Class 45/46's with dual braking equipment and the equipping of fifty Class 45's with electric train heating equipment for the Midland Line services. Once all the factors mentioned above fell into place the future dimmed considerably, initially for the Class 46's but also for the Class 45's. When 45067 was involved in a minor collision near Ilkeston whilst working the 11.50am Glasgow - Nottingham passenger service on July 8th 1977 it was quickly moved to Derby Works for evaluation. However repairs were not forthcoming, despite the damage being of a minor nature. This was the first Class 45 to be retired (during July 1977) and preceded by a couple of months any inroads into the Class 46 fleet. Photographs courtesy: collection of Robert Drake (top) and Graham Turner (middle & right). 45067 had been delivered during April 1961 from Crewe Works to Derby (17A) as D115. Despite it's wanderings across the regions 45067 was only ever allocated to Derby or Toton (D16 Nottingham Division). It is seen here shortly after its collision with a derailed coal train near Ilkeston. Although the damage sustained was not considerable it was enough to put it on to the scrapline at Derby. Derby would still effect major repairs to the Peaks, including some with accident damage - 46036 for instance - but the example of 45067 indicated that decreasing limits were now set for the Peaks. 45067 would linger at Derby for almost three years before finally being broken up in June 1980. In the second view, at Derby Works on June 6th 1978, the view shows the damage sustained to the side. The third view shows the locomotive along with another Peak in the cutting up area (January 1980?). 45067 is on the right and it shows the undamaged cab, with the nose removed, presumably for reuse on another locomotive (candidates could be 45041, 45049 or 45147. At the beginning of the winter timetable Laira depot stored unserviceable 46005. This was the first class 46 to be treated as such and indicated that this was the beginning of the end for this Class. During January 46005 made its way to Derby Works where it was officially retired. 46005 was dealt with quickly by Derby. It arrived in the third week of December 1977, it was completely stripped out by February 1978 and was gone by April 1978. 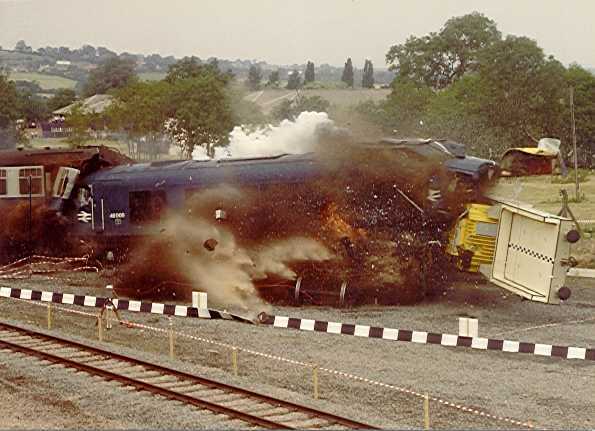 The next two Class 46 withdrawals featured accident damaged locomotives. 46024 was involved in a minor collision at Hereford during April. Similar to 45067 it sustained damage which in better days would have been quickly repaired, for 46024 it was a one way trip to Derby Works for dismantling. With damage very similar to that of 45067 the now withdrawn 46024 stands at Derby Works awaiting stripping, and then cutting up. Its October 10th 1978 and 46024 is just about done in. Now parted from its bogies it will not be long before it will be unrecogniseable. The next Class 46 withdrawn was 46003 which suffered considerable fire damage whilst in operation on the Western Region. It was quickly sent to Derby for evaluation, being withdrawn in October 1978. A badly scorched 46003 stands at Derby Works on January 20th 1979, its working days over. Fortunately for this machine the fire occurred in the bogie that was not directly under the main fuel tanks, those being situated at the undamaged end. 1979 was a quiet year for the Peaks, no withdrawals took place, although a number of the previously retired Peaks still lingered at Derby. This was not a good year for the Class 45/46's. Though the year opened quietly the summer brought the first of thirty eight withdrawals (approx 20% of the Class 45/46's). For many the locomotives were placed in store during August and September, with official withdrawal taking place in December. First to go was 46012 withdrawn in July followed by 46013 in August. These were Laira based locomotives and surprisingly they went direct to Swindon Works for storage. Also stored in August were 45008 & 45047, both being consigned to Derby Works. Derby Works, October 29th 1980, 45008 is in store, by December it will be officially withdrawn and eventually reach Swindon for cutting up. Its August 1980 and 46012 has been withdrawn for about a month. It's reported that it was withdrawn due to a cracked frame and as a sign of things to come, it did not visit Derby Works after withdrawal, rather it went directly to Swindon. A visit to Swindon works on October 26th 1980 finds a lineup of stored Class 46's on the other side of the main running lines opposite the workshops. 46006 is the leading locomotive. With the summer timetable over the real onslaught began, during September three Class 45's and twenty three Class 46's were stored serviceable. The stored Class 45's were all allocated to Tinsley whilst the majority of the stored Class 46's were from Laira - they were sent to Swindon for storage. This storage for seven of the Class 46's was brief, six (46004/011/016/023/027/028) were reinstated during September, whilst one (46026) went back to work during November. The onslaught continued in November, seven more Class 46's went to storage, as did 45039, whilst another one, 45030, was withdrawn outright. At years end the twenty one stored Class 46's were withdrawn. However twelve of these would get to fight another day, since they would be reinstated between February & December 1981. Of the Peaks stored since August 45024 had been retired during September because of its considerable fire damage whilst 45008/021/032/039 were withdrawn in December. As the New Year opened more withdrawals occurred, Tinsley withdrew 45018/28/29 during January whilst Gateshead retired 46053 during February. This latter retirement was offset by the reinstatement of 46002 from storage at Swindon, the first of fourteen Class 46's that would return to service during 1981. Further withdrawals commenced at the start of the summer timetable in May - Tinsley surrendered another five Class 45/0's (45011/025/027/031/035) whilst Gateshead withdrew 46033/055. Apparently any increased traffic during the summer season could be met by the existing locomotive fleet. During August 45061 was retired. The Open Day at Swindon on June 6th 1981 produced a veritable smorgasboard of locomotives in storage or withdrawn. Some looked like they'd just been taken out of service, others like fire damaged 45024 clearly had no future as operational locomotives. A sight more familiar to Cricklewood, Toton or Holbeck was this line up Class 45's at the June 1981 Swindon Works Open Day. However these were in a stored/withdrawn category with little hope of seeing any more revenue earning service. The first visit of 46038 to Swindon for storage was during the summer of 1981 (seen at the June 6th Open Day). It was later reinstated to Gateshead late in November 1981 but suffered a generator failure leading to withdrawal in March 1982. After the second withdrawal there would be no escape from Swindon, the locomotive would linger awhile, but by the time of this view - November 22nd 1985, there is little time left. Equally ravaged 25101 sits in the backfround. During September 46002 was retired, in its place 46001 was pulled from storage and put back into service. Also retired in September were 45071 and 46048 whilst 45073 and 46008/032 were retired in October, all three Class 46's had avoided storage in 1980. An increased demand for Type 4 locomotives found the authorities looking to the storage lines at Swindon for an answer. Brought back into service were 46006/007/010/017/018/021/022/025/038/050/054. The expectations demanded of these locomotives must have been something of a challenge, most had been in open storage for at least twelve months. 46001 succumbed in December, to be replaced by 46037. The revival for 46006/007 was brief, both being withdrawn during January. These two losses were covered by the reinstatement of 46032/033 - is 033 correct??? and 46055. Retired in March were 46022/038. May claimed 46036, one of the locomotives that had remained active throughout this period. After eighteen months in storage 45029 was reinstated to Tinsley during August. The end of the summer timetable brought about more withdrawals: 46050/055/056 during October and 46049 in December. Two early withdrawals during January were 46021/029. 46031 followed in April, again one of the Class 46's that remained in service throughout. During May 45044 was withdrawn. Although heavy repairs had long since ceased on the Class 46's, Stratford frequently recieved withdrawn Class 46's to swap out major components that were then fitted into another Class 46 in order to keep the good machine going a little longer. Seen here at Stratford is a somewhat battered 46021 on March 26th 1983, perhaps donating some still useable component to a sister machine. A casualty in 1983 was 45045, damaged in a collision at Saltley on February 10th 1983. After removal to Derby for evaluation the locomotive was withdrawn on May 9th 1983 (seen here August 23rd 1983). It eventually reached Vic Berry's, Leicester for scrapping during October 1986. The attrition continued with 46004 during June, this locomotive had only briefly gone into storage during September 1980, it had been quickly revived and sent off to Gateshead for further service. Again at the end of the summer timetable more Class 46's fell by the wayside, October claimed 46009/039, whilst December saw 46016/018/051 withdrawn. 45053 was withdrawn during November. By the start of the 1984 only about a third of the Class 46 fleet remained in service with all surviving members allocated to Gateshead. An oddity in the rundown of the Peaks was 45053. It had been withdrawn twice, in March and November 1983 and consequently moved to Swindon. It was later sent to Crewe for including in the Class 45 repair programme. On arrival at Crewe this repair was cancelled and 45053 remained at Crewe until broken up in October 1988. It is seen here on June 2nd 1984. During April 46017/032/044 were retired, May claimed 46014/028/047 whilst June saw 46037 retired. Not even my worn and weary 1972 Hillman Hunter deserved the fate that befell 46009 on July 17th 1984. It had been delivered to Derby during December 1961, and would spend the next twenty two years criss-crossing the country, working out of Laira or Gateshead. It had recieved a light repair at Derby Works during October 1980, the third to last �46� to receive any classified repair. It had returned to Derby during Christmas 1980 for rectification work. Its boiler was isolated during December 1982 and it received the power unit from 46004 at Stratford the following August. Although withdrawn in October 1983, it received Research Dept # 97401 during November 1983 and was allocated to Toton for Research Department purposes. It was finally withdrawn in July 1984, still bearing its original number. Presumably its withdrawal was precipitated by the need to use it on July 17, 1984 in a CEGB Atomic flask crash test demonstration, using Flatrol DB550019 at the Old Dalby test track. As dramatic and re-assuring as the demonstration was (or so we are led to believe), the real world often doesn't play so neat or clean. As for 46009 its remains were broken up on site shortly after the demonstration. Two Class 46's barely survived the summer, 46047/052 were taken out of service during September. Also retired in September were 45002/023/043/050. The remaining Class 46's soldiered on until November when all remaining Class 46's (46010/011/025/026/027/034/045) were retired. An unfortunate withdrawal was that of 45147, stored unserviceable during December and withdrawn in January 1985. It had been seriously damaged in a spectacular rear-end collision near Salford on December 4th 1984 whilst working the 10.05 Liverpool - Scarborough service. Regretably the driver and one passenger were killed, fortunately the front coaches were only lightly loaded. The close proximity of the M602 allowed the local fire services major access to deal with the conflagration and also provided the news services with easy access to report the story. Such was the spectacular nature of this collision that the story was picked up by the TV stations in Los Angeles, where it was seen by your scribe. 45147 was broken up close to the accident site by Vic Berry's, Leicester. Not quite sure where this view came from. There is little to be left to the imagination when viewing the unfortunate remains of 45147 after its rear-end collision in Manchester. The locomotive had been outshopped from Crewe during January 1983, as such it would have been expected to give several more years service. However no Peak had sustained such damage over the years, making it a certainty that even in the best of times this amount of damage would have seen its withdrawal. All was laid to rest by Vic Berry, on site during March 1985. 45054/057/064/075 were withdrawn during January. 45010/065 were retired in March, 45038 was stored unserviceable at this time, not being withdrawn until June. 45042/055/072 were retired in April. 45015 was retired at Toton during August, but gained a new lease of life as ADB968024 during September. September claimed 45019/074. During November 45003/004/016/020/056/060 were retired. 46010 had been delivered to Derby at the end of 1961 as D147. In its early travels it spent time at Corkerhill for crew training, allowing it to wander over much of southern Scotland. Its last major repair was at Derby during 1979. It was stored unserviceable at Swindon during October 1980 and withdrawn in December. After a year at Swindon it was reinstated during November 1981 to Gateshead, escaping from Swindon on February 1st 1982 reaching Stratford DRS during March. Its final months in service during 1984 do not present a pretty picture. After brake trouble at Toton on March 7th and loss of power on the 20th at Newton Heath, it was stopped at Toton on the 26th for tests, being released on April 2nd. It was at Tinsley by 4th for coolant system repairs, spending the rest of April and May there. It was finally released on June 3rd but failed at Severn Tunnel Jcn on 12th with turbocharger problems, being forwarded to Gateshead, re-entering traffic by June 21st. July 9th saw it stopped at York with bogie trouble, it was released on 19th after attention at Thornaby. A trip to South Wales ended with coolant and air leaks and sidelined it from July 23 - 26th, when it travelled to Leicester, being stopped there until 31st with power unit problems. Released on August 3rd it reached Bristol the next day, to be stopped with engine faults. It was forwarded to Gateshead and released by 13th. An oil leak at Exeter on August 20th saw it return to Gateshead to await materials. It would be finally withdrawn here on November 4th without turning a wheel. It was noted at Tyne Yard on December 1st(?) with 46026/35/52 and moved as 19.15 to Doncaster on November 29th with 46035 as power. Between December 1984 and late August 1986 the 46010 languished in the Doncaster Works scraplines, before being removed to the yards by the station. It should have been moved with the other scrap locomotives to Goole but for unknown reasons ended up at Doncaster depot. Here it languished for many years, presumably having disappeared off the TOPS computer. This 'error' led to 46010 eventually reaching preservation, despite all the odds! Withdrawn Peaks sent to Derby, whilst yielding a variety a spare parts were only to fill the Works sidings. Present here on October 12th 1985 are 45043, 45057 & 45055, all would eventually be removed to Vic Berry's, Leicester for final scrapping in 1987. The beginning of the year opened with 45001/068 condemned. January also saw the second Class 45/1 retired, that of 45109. During March 45005/014/015/026/059 was retired whilst 45036/063/077 & 45109 reached the end of the line in May. 45014 had the misfortune to be involved in a collision at Chinley with 31436 on March 9th. It was removed to Ashburys yard where it lingered intact until late in August when a crew from Vic Berry's chopped the Peak into three sections and removed them by road for final disposal at Leicester. Withdrawn 45014 sits in Ashburys Yard, Manchester on May 10th 1986. Vic Berry would remove the bogies, chop the locomotive body into three parts and ship everything back to Leicester for final dismantling. 45069 & 45120/123 were retired during July, however 45120 was quickly reinstated. 45012 was withdrawn from Toton during August but was reinstated by month end. The end of the summer timetable in September 45006 & 45102/131 were taken out of service. All the remaining Class 45/0's were transferred from Toton to Tinsley during September. 45076 & 45101/138 were withdrawn in November and 45116 in December. Following in the footsteps of the Class 45/0's all the Class 45/1's were transferred from Toton to Tinsley during November. By October Derby Works had become host to eight retired Peaks, seven of these were sold on to Vic Berry and were removed to their Leicester yard towards the end of October. These were the first complete Peaks to be received at Vic Berry's for scrapping. After this move the only withdrawn Peak to remain at Derby was 45117. At about the same time the withdrawn locomotives at Goole were forwarded to Leicester, this included 25287, 46027 and seven 45/0's. When Doncaster ceased cutting up locomotives there were still a considerable number on-site awaiting scrapping. These were moved to Goole whilst a final location was found for their scrapping. Here on October 18th 1986 45019 heads a lines of Peaks and Class 25's. These would eventually end their days at Vic Berry's Leicester. After withdrawal Holbeck acquired 45009 for use as a training locomotive for the shed's fitters. It is seen here at Holbeck on November 8th 1986 looking a little the worse for wear. On January 19th 47199 cleared Derby Works of 25200, 40075, 45057 & 45117 to Vic Berry's, this move left no Class 25's at Derby and just one withdrawn Peak on the premises, that of 45050. 45070 was withdrawn during January. 45114/45148 were withdrawn in February. 45120/135 were withdrawn in March. The arrival of the summer timetable in May 1987 saw the end of diagrammed passenger workings on the Midland mainline and Trans-Pennine route. Many of the Class 45's withdrawn in April & May were a result of these changes. 45013/051 & 45122/126/139/146 were withdrawn during April. 45105/111/112/118/119/125/127/130/132/133/136/143 was retired in May. The summer diagrams contained work for 21 Class 45/1's and 16 Class 45/0's, assuming availability of 66%. Its May 31st 1987 and Tinsley has become the last depot to provide a home for the Class 45's. Here 45143, 45113 & 45139 are lined up in the shed. Of the three only 45113 remains in service at this point, the other two were retired during May. The two nearest machines provide a contrast in the nose detail. This buildup of withdrawn locomotives occurred at Tinsley and Toton. Late in May the first of six convoys of retired Peaks moved from Tinsley to storage at March/Whitemoor. 45129/137/142 were retired in June - the three Class 45/1's were considered surplus to requirements of the summer diagrams. 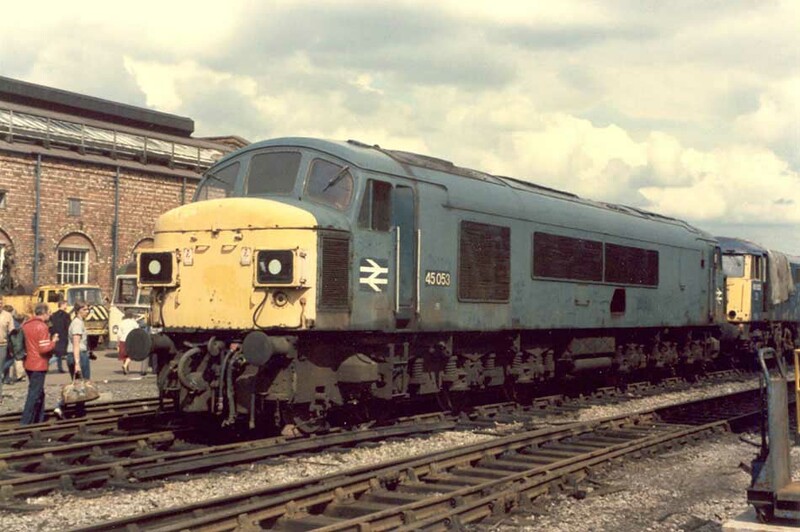 The Class 45/0 diagrams did not demand much of the locomotives allocated, the fleet was reduced with those approaching major exams being taken out of service - these were 45040 in June and 45022/029/034/040/062/066 in July, 45062 had come to grief whilst working the Baker's Dozen railtour on June 28th. 45108 was retired in August. 45058 & 45134/149 were retired in September. During September five of the Class 45/0's that had been withdrawn in July were reinstated at Thornaby and renumbered 97409 - 97413. They were to be used on the Newcastle - Berwick electrification wiring trains, freeing up some Class 31's for other duties. The last quarter of 1987 saw the withdrawal rate ease considerably with 45049 in October, 45121 in November and 45144 during December. One of several locations used to store the retired Peaks was Toton. Seen here on an overcast March 7th 1987 are 45006, 45102, 45077, 45101, 45123 & 45131. It is reported that 45006 had been retired in September 1986 due to poor condition and general unreliability. Presumably the singed nose occured after its withdrawal. Another collectiong point for withdrawn Class 45's was March. In this line-up from June 14th 1987 45013 leads 45126, 45122, 45148, 45114 & 45146. This view is the above line up from the other end with 45146 leading. Thornaby played host to a number of withdrawn Peaks. Seen here on June 13th 1987 is withdrawn 45070 & 45120. At the end of June 45070 would be hauled off to Darlington as a 'technical exhibit'. 45108 keeps company with 47007 at Stratford on July 29th 1987. The Peak had been derailed at Cricklewood and sent to Stratford for evaluation, the news was not good, 45108 was withdrawn on August 4th. 45108 however would eventually reach preservation. 45124 was retired in January. 45053/145/45150 went in February. 45140 was retired in March. 45104 was retired in April. 45041/052/115 were withdrawn in June. By July there were only nine active non-departmental Class 45's left in service and time was running very short for them. 45007/012/037/106/107/110/113 were retired in July. 45046/103/128/141 were retired during August. And then there were none. But not quite - like the earlier use of 40122 as a celebrity locomotive so it would be that on August 4th 45106 was re-instated for similar useage. During March 1991 parts of Vic Berry's yard at Leicester was consumed by a major fire which led to the permanent closure of the scrapyard at this location. Of the few remaining scrapyards certified to handle asbestos, it was left to MC Metals, Glasgow to finally lay to rest the remaining Peaks that still littered parts of the country! 45001/02/04/10/26/48 moved from Leicester to Glasgow during December, the first Peaks to make the journey to Glasgow. At least they had the dignity of being moved by rail, rather than being de-bogied and tossed on the back of a lorry for a quick spin up the M6, as happened to many of the smaller locomotives making this last journey. This first batch of Peaks were broken up very quickly. One other movement to Glasgow took place in December, that of 45044/49/51/70 from March/Tinsley. When this convoy reached Carlisle, withdrawn 25325 & 25905 were added to the consist. No significant movements took place in 1989 apart from the transfer of six Peaks (made in two journeys) from March to Egginton to be used as dead-load vehicles by the Research Department at Mickleover. These rather tired looking locomotives included 45111/125/136 in one move & 45126/146/148 in the other. 45106 was retired on February 20th after sustaining fire damage on the 07.12 Derby - St Pancras services. In an attempt to continue the goodwill 45128 was reinstated the same day, the load test carried out on the Peak was not successful and the locomotive returned to retired status on April 22nd. And that was that. 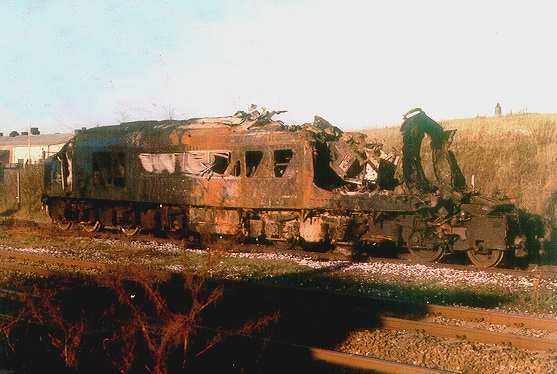 Going out in a blaze of glory proved to be the literal end for 45106 early in February 1989. With this damage there could be no reprieve for 45106, seen here at Tinsley on August 21st 1989, with one last short journey to make to Booth's Rotherham for scrapping. In March one movement of 45103/107/110/113/115 took place from Tinsley to Glasgow. Its the end of the road for 45113, seen here at MC Metals, part of the side has already been cut away to allow salvage of items from the engine room. Although the date is not known 45113's stay here was brief, so its probably April 1990. The movement northward for the Peaks was still meagre, during September Tinsley sent on six Peaks, in two loads to Glasgow. Its a crisp, clear February day in 1991 as Springburn is host to a line up of Peaks, with 45037 nearest the camera. Fading and almost forgotten, 45114 stands at March on May 17th 1991. A long line of Peaks, headed up by 45033, rot at Tinsley on June 24th 1991. Within six months 45033 will have been dragged off to Glasgow and broken up - four years after having been taken out of service. Very rusted rails indicates 45124 and sisters have been here for quite a while. 45124 was the first of the Class 45's to pass through Crewe Works for refurbishment during the spring of 1982. Its working days came to an end at Leicester on December 29th 1987 after sustaining a bogie fire. Metal rusts and paint fades as flowers grow as silent sentinels to long vanquished behemoths. No more the call to work 'The Palatine', 'Thames-Clyde' or 'Robin Hood', no more the throngs of holidaymakers on 'The Devonian' or 'The Cornishmen' - now just one last call to Glasgow. Six more Peaks were moved to Glasgow, three from Tinsley & three from Toton. Another Peak to move was 45106, sold to Booth's, Rotherham along with a quantity of Class 47's. They arrived towards the end of March, by the end of April 45106 was no more. Mud & metal surround dismembered locomotives from a variety of Classes. Front and center is part of 45046. This locomotive had been the last Class 45/0 in traffic and the last of the original named Peaks to remain in service. 45145 has reached the end of the line at MC Metals, Springburn. After slumbering away in the weeds at March for almost seven years the remaining twelve Peaks were readied for movement to MC Metals, Glasgow. 45119/138/142 moved on February 14th, hauled by 47372. 45062/137/139 moved on February 25th, hauled by 47341 again. 45058/076/143 were the last to leave on March 10th, again 47372 did the honours. Once these hulks had reached Glasgow they were broken up very quickly. A dismal wet day at MC Metals, Glasgow finds 45140 in company with some other Peaks. More to follow as time permits.